Honeywell Analytics Fire Sentry FS24X is a quantum leap in flame and fire detection with its sophisticated software and detection technology. Fire Sentry FS24X is a quantum leap in flame and fire detection with its sophisticated software and detection technology. The Fire Sentry FS24X is the latest generation high technology Multi-Spectrum Triple IR (IR/IR/IR/Visible) Fire and Flame Detector, which is part of our FSX family of advanced technology Electro-Optical fire detectors. Using our patented* WideBand IR, WideBand 4.3 micron IR, and Visible detection technology, the Fire Sentry FS24X is a quantum leap in flame and fire detection. Sophisticated software algorithms and dual microprocessors ensure that the Fire Sentry FS24X has the highest fire detection performance combined with optimal false alarm rejection. The WideBand IR Infrared technology using high-speed solid-state Quantum sensors allows detection of all types of fires, hydrocarbon and non-hydrocarbon, in all weather conditions. If the detectors signal is blocked by ordinary window glass, the patented WideBand IR sensors will still alarm to the fire albeit at a reduced sensitivity and slower response time. Dual microprocessors provide a high level of fail-safe operation combined with fast and reliable performance. The master microprocessor performs high-speed digital sampling and signal-processing calculations, while the slave microprocessor handles various sensor data, performs communications, self-diagnostics and provides interface versatility and additional memory for storing Event Log and FirePic data. The Fire Sentry FSX family of detectors feature our patented* FirePic data storage and information retrieval facility. FirePic records pre-fire data, which can be recovered from the Detectors non-volatile flash memory for post fire analysis and postulation of the fire cause. Additionally, unique Real-Time Graphing (RTG) allows viewing of the data which the Detector actually sees. A combination of outputs makes the Fire Sentry FS24X a truly versatile detector for todays demanding industrial requirements. The Fire Sentry FS24X detector has a detection range greater than 60 m (200 feet) (Very High Sensitivity setting) for the detection of a 0.1 m2 (one square-foot) Heptane reference fire and has a cone of vision far greater in volumetric coverage than any other Multi-Spectrum IR Detector. This means fewer Detectors can be used as compared to other manufacturers Detectors. FS24X-212-21-1 FS24X-211-21-1 QuadBand™ IR3+ Detector, Copper-Free Aluminum Encl., (2) ¾"NPT entries FM, cFM, IECEx & ATEX approved with FSX-A014R Optional Registered HART Module for FS24X Detectors Factory installed. FS24X-212-22-1 FS24X-211-22-1 QuadBand™ IR3+ Detector, 316 Stainless Steel Encl., (2) ¾" NPT entries FM, cFM, IECEx & ATEX approved with FSX-A014R Optional Registered HART Module for FS24X Detectors Factory installed. FS24X-212-23-1 FS24X-211-23-1 QuadBand™ IR3+ Detector, Copper-Free Aluminum Encl., (2) M25 entries FM, cFM, IECEx & ATEX approved with FSX-A014R Optional Registered HART Module for FS24X Detectors Factory installed. FS24X-212-24-1 FS24X-211-24-1 QuadBand™ IR3+ Detector, 316 Stainless Steel Encl. (2) M25 entries FM, cFM, IECEx & ATEX approved with FSX-A014R Optional Registered HART Module for FS24X Detectors Factory installed. FS24X-912-21-1 FS24X-911-21-1 QuadBand™ IR3+ Detector, Copper-Free Aluminum Encl., (2) ¾"NPT entries FM, cFM, IECEx & ATEX approved with FSX-A014R Optional Registered HART Module for FS24X Detectors Factory installed. 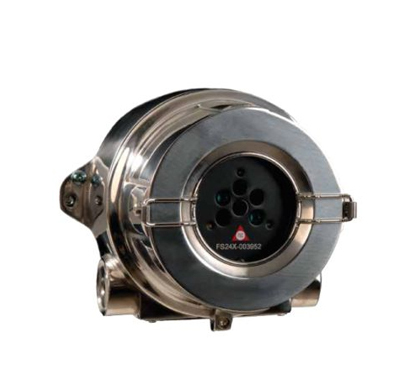 FS24X-912-22-1 FS24X-911-22-1 QuadBand™ IR3+ Detector, 316 Stainless Steel Encl., (2) ¾" NPT entries FM, cFM, IECEx & ATEX approved with FSX-A014R Optional Registered HART Module for FS24X Detectors Factory installed. FS24X-912-23-1 FS24X-911-23-1 QuadBand™ IR3+ Detector, Copper-Free Aluminum Encl., (2) M25 entries FM, cFM, IECEx & ATEX approved with FSX-A014R Optional Registered HART Module for FS24X Detectors Factory installed. FS24X-912-24-1 FS24X-911-24-1 QuadBand™ IR3+ Detector, 316 Stainless Steel Encl. (2) M25 entries FM, cFM, IECEx & ATEX approved with FSX-A014R Optional Registered HART Module for FS24X Detectors Factory installed. FS24X-911-10-6 Replacement Electronics Module for 911 (90° FoV)Series standard temperature range detector. EN54-10. FS24X-912-10 Electronics Module with Registered HART Communication for 911 and 211 series.